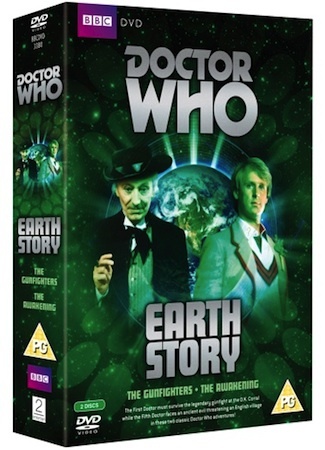 Rather uncomfortably bundling together a First and a Fifth Doctor story together in a collection known as “Earth Story”, the thematic link with the latest Doctor Who release is, well, that they’re both set on Earth. Simple, really. Combining one story not known for its popularity in Doctor Who fandom – the overt humour in William Hartnell’s The Gunfighters often branding it unwatchable – with another praised for its ability to condense a complex tale into just two episodes in the shape of Peter Davison’s The Awakening, the set makes for an odd combination. In The Gunfighters, the Tardis brings her crew to the famed town of Tombstone when the Doctor finds himself suffering from toothache. Deciding that America in the 1880s is the best place for medical attention, the Timelord seeks out Doc Holliday (Anthony Jacobs), a man who is currently somewhat at odds with the Clanton brothers, leading to much confusion regarding the Doctor’s identity and a gunfight that really isn’t OK. In The Awakening, modern day (1984) England is the location for some village war games, recreations of a Civil War battle. As the Tardis materialises, it becomes clear that an alien war machine known as The Malus has started to meddle with the timelines, merging the 1980s with the 1640s and leaving the Doctor, Tegan (Janet Fielding) and Turlough (Mark Strickson) to try to put things right. With its dodgy American accents and a script which attempts to play too much for laughs, The Gunfighters isn’t an easy watch. The overuse of the Ballad of the Last Chance Saloon, a not-so-witty little ditty sung at various points of the four episodes is wearisome to say the least, while the change in character of the Doctor, Steven (Peter Purves) and Dodo (Jackie Lane) to facilitate them misunderstanding the gravity of their predicament is insulting to the audience. Taken as a piece of throwaway 1960s TV this is just about passable, with Hartnell on good form and the set design and direction impressive, but as a piece of drama it’s pretty average. Eric Pringle’s The Awakening is a much better example of Who at its best, the series regulars supported by a high quality guest cast, including ex-Liver Bird, Polly James, and ex-Stig of the Dump, Keith Jayne. Both actors are believable and level out some of the more outrageous performances. With yet another member of Tegan’s family making an appearance and no sign of the padding which inevitably creeps into multiple part adventures, The Awakening is a lean slice of 80s Who which more than makes up for any weakness evident in The Gunfighters. With the Doctor Who range’s commentary moderator of choice, Toby Hadoke, in charge of proceedings for both stories, things go smoothly as cast and crew come together to recall their time on the series. Peter Purves continues his love-in with Who alongside actors David Graham, Shane Rimmer and Richard Beale plus production assistant Tristan DeVere on The Gunfighters, while director Michale Owen Morris and script editor Eric Saward are the slimmed down pairing for The Awakening. Both tracks are entertaining and informative throughout, an honesty about mistakes made and an admiration for what was managed all those years ago evident from all participants. The standout documentary in the set is The End of the Line, a frank look at the production of the programme’s third year. Contributions from those who were there are backed up by excerpts from memos and letters written at the time, while today’s fans also help put past events into some context. It’s an impressive production which, like all the best documentaries, deserves a wider audience than just Doctor Who fans, and one can only hope that at some point in the future 2entertain consider releasing a documentary-only set charting the Classic era’s development. One of the odder additions to The Gunfighter’s set is the latest installment of Tomorrow’s Times, which sees a badly miscast Mary Tamm looking at how the series was covered in the press in the 1960s. Tamm’s reaction to one piece of Dalek news is quite the strangest thing you’ll see on a Who DVD this, or any other, year. The Awakening benefits from a return visit to the fictional village of Little Hodcombe by the cast and crew, with contributions from local residents, and it’s a charming insight into the story’s production and legacy. Elsewhere there’s a look at the making of the story’s creature and some extended and cut scenes that didn’t make the final cut. As ever, both stories feature PDF Radio Times clippings along with photo galleries and production notes, which by no means deserve to be mentioned last but which are hard to do justice to in a review – just make sure you read them and your enjoyment of any Doctor Who adventure will be enhanced. If there’s one thing that Doctor Who loves, it’s Earth colonists (or descendents of Earth colonists) having a hard time of it somewhere in deepest, darkest space. 1984’s Frontios takes this premise and runs with it, the Fifth Doctor (Peter Davison) arriving in the midst of a particularly nasty meteorite bombardment, the results of which requires the time traveller’s help. As the Doctor, Tegan (Janet Fielding) and Turlough (Mark Strickson) try to assist the planet’s inhabitants, the Time Lord getting confused for an enemy spy by leader Plantagenet (Jeff Rawle) in the process, the viewer becomes embroiled in the politics and confusion of a populace who are tired of being attacked by an unseen enemy. When that enemy is discovered to be closer to home than anyone expected, the story is flipped on its head to become something much more complicated than a base, or rather planet, under siege tale. Christopher H Bidmead’s return to Who is a welcome one, his script removing much of the romp-factor from the programme and swapping it with intelligent dialogue and what feels like a genuine challenge for the Doctor and his crew. Indeed, Turlough gets a decent share of screen time here, the reawakening of dormant memories handled well by Strickson, even if his reaction to the Tractators could be seen to be a tad OTT. Tegan is also given something to do here, Fielding reacting well to Davison whether he’s in breathless or comic mode. Of the guest cast, while Rawle is strong as the out-of-his-depth Plantagenet, it’s William Lucas as Range and Lesley Dunlop as his daughter, Norna, who are the most interesting additions. The pair have a chemistry that makes their relationship believable, something that’s important when you’ve got power-hungry aliens vying for attention. Though Frontios’ budget was tiny (as alluded to by Rawle in documentary, Driven to Distractation), designer David Buckingham managed to make the interiors look suitable lived in, although the occasional exterior shot, in reality a BBC studio, does let things down. Still, a Doctor Who fan can forgive iffy FX and dodgy monster costumes when the story is as good as this, and in Frontios we have something of an overlooked gem that reminds us just why Davison was so special and his era ripe for rediscovery. Without his usual partners in crime, (Fielding, Sutton and Strickson I’m looking at you! ), the Frontios commentary may not be quite as buoyant, but it’s still worth booting up to hear Rawle and script editor Eric Saward have their say. Add to this an informative set of production notes, an isolated music score, deleted footage, Radio Times cuttings and a few other nice-to-have’s, and Frontios becomes yet another important addition to the Doctor Who range. It was in October 2010 that 2entertain first delighted and annoyed Doctor Who fans with the release of their Revisitations DVD set: delighted because three classic stories had been newly remastered with added extras, annoyed because each of them was already available on DVD. No matter what your feelings about double-dipping on DVDs, the fact was that the first set was an impressive achievement, offering buyers new insights into stories that deserved, well, revisiting. Now they’re at it again with the re-release of The Seeds of Death, Carnival of Monsters and Resurrection of the Daleks in Revisitations 2: be prepared to be delighted and annoyed all over again. The Seeds of Death sees the Second Doctor (Patrick Troughton) , Jamie (Frazer Hines) and Zoe (Wendy Padbury) cross paths once again with the Ice Warriors who are determined to make the Earth their own. In Carnival of Monsters, the Third Doctor (Jon Pertwee) takes centre stage in Robert Holmes’ high-concept tale which sees alien creatures and 1920s passengers on an ill-fated ship brought together thanks to a seemingly benign peepshow. Finally, Peter Davison dons cricket gear for a turn as the Fifth Doctor in Resurrection of the Daleks. Along with Tegan (Janet Fielding) and Turlough (Mark Strickson), the Doctor must enter into yet another battle with the Daleks and Davros, this time in 1980s London. With a number of stories under their belts, Troughton, Pertwee and Davison offer confident performances that make it all look so easy. For anyone simply looking to enjoy more of their favourite Doctor, they’re unlikely to be disappointed. Script-wise, Seeds is confident enough to leave the Doctor out of proceedings for a good while, before allowing Troughton to quietly take over. As usual, the Second Doctor is happy to watch from the shadows as events spiral out of control, his glee at being the one to save the day palpable. Director Michael Ferguson keeps things moving at a decent pace throughout, some interesting camera angles introduced as the Ice Warriors make their moves. For Carnival, Barry Letts does an admirable job of giving energy to Robert Holmes’ layered script, his skill at keeping one eye on the technical side and the other on his cast resulting in an accomplished, and hugely enjoyable romp. Eric Saward’s Resurrection is the weakest of the three tales, perhaps because we’ve seen the Daleks schemes too many times or perhaps because it’s all just a bit of a muddle. Nothing is quite what it seems here and, apart from a strong turn from Maurice Colbourne as Lytton, it’s hard to care much for anyone. When it comes to the much-touted extras, the main highlight here is Resurrection’s Come in Number Five, a David Tennant-hosted look back at Davison’s time on the show. With input from many of those involved and some refreshingly honest opinions, Tennant may look a bit grim throughout but this should leave fans of the blonde one happy. Throw in a new Ice Warriors documentary and a fun look at the monsters that came back for more for Seeds, plus a new commentary, an entertaining look at the making of the story and an investigation into the careers of Who bit-players for Carnival, and you’ve got another fascinating package that tries hard to justify its place on your shelf and, on the whole, succeeds. Just for kids. That’s the phrase often used to both dismiss and endorse Doctor Who in the media, some fans happy that the show is the children’s series adults adore while others see it as only good enough for the under-tens. Occasionally a story comes along which confounds the critics and the fans alike. In the latest Doctor Who DVD set, The Mara Tales (2entertain), we get two of them. First up is Season Nineteen’s Kinda, Christopher Bailey’s script taking the Fifth Doctor (Peter Davison) to the planet Deva Loka, where a survey team is threatening to go native as the alien Mara infiltrates the minds of those in charge…and Tegan (Janet Fielding). Season Twenty offered a rematch for the Time Lord and the Mara, as the Tardis arrives on Manussa, a relatively peaceful planet whose populace remember the Mara from their history and who are preparing to celebrate their banishment. Things don’t go well for Tegan as the Mara surface in her mind, causing a race against time for the Doctor and Nyssa (Sarah Sutton) to help banish them. With these two stories, both influenced by Buddhism and psychiatry to varying degrees, Bailey brought some depth to the Tardis crew and to the people they meet. Whereas many adventures give us alien planets and cultures painted with broad brush strokes, Kinda and Snakedance tried to delve beneath the surface of the psyches involved. In Kinda, Hindle (Simon Rouse) is pushed to the limit by the presence of the Mara, while Tegan is given some a chance to shine and grow as the snake within her is unleashed. For one of the few times in the classic series, sexuality rears its head in Kinda, though there’s nothing too overt for the seven-year-olds in the audience. Unfortunately there’s also that snake prop at the end which threatens to derail the story: it’s to the actors’ credit that we stick with it till the final moments. Janet Fielding’s ability to flex her acting muscles continues in Snakedance, one of the few direct sequels in the show’s history and one which actually improves on its predecessor. Here, the Doctor is seen by the Manussians as a raving lunatic who speaks of the Mara’s return, Davison’s breathless performance one of the best of his brief tenure. From the set design and direction through to the music and the acting, Snakedance is a tour-de-force of 1980s Doctor Who made at a time when the series was about to lose its place in the BBC’s affections for many years to come. While Snakedance, with its political wrangling, clever dialogue and ability to dress Martin Clunes in a shocking set of threads and still appear to have some authority, is undoubtedly something to be savoured by the adults, it’s tempting to think that the aforementioned children in the audience could have been left wanting. There’s little in the way of action or time travel in Snakedance or Kinda, but almost thirty years on they’re all the better for it. The extras on this set compliment the stories near-perfectly, with documentaries Dream Time and Snake Charmer explaining the genesis of Kinda and Snakedance respectively. Christopher Bailey makes for a refreshingly honest contributor, the benefit of hindsight also helping script editor Eric Saward to give his candid views on the stories. Peter Davison, Janet Fielding, Nerys Hughes and Matthew Waterhouse take on commentary duties for Kinda, the latter happy to take a gentle ribbing from his colleagues throughout. Director Peter Grimwade is the subject of another lengthy documentary, with extended and deleted scenes, an isolated music score, information text and optional CGI – be rid of the toy snake forever! – bulking out the disc. Over on Snakedance, Davison and Fielding are joined by Sarah Sutton for the commentary while another stack of deleted scenes, an optional music track, photo gallery, information text and Radio Times listings are present and correct. Spruced up with improved picture quality and beefed up with enough extras to fill the Pandorica a few times over, three classic Doctor Who stories are now back to entertain fans all over again. The Talons of Weng Chiang sees Tom Baker’s Sherlock Holmes-inspired Fourth Doctor roaming the foggy streets of Victorian London with his very on Eliza Doolittle in the shape of Leela (Louise Jameson) while aliens and rogues get in his way. Peter Davison’s swansong, The Caves of Androzani, is the type of multi-layered, fast moving and near perfect romp that we remember all of his stories to be (at least until we see Time Flight again), a doom-laden epic which pits the Doctor and Peri (Nicola Bryant) against Sharaz Jek (Christopher Gable) and a gaggle of mercenaries. Finally, the 1996 TV Movie stars Paul McGann as the Eighth Doctor, destined to enjoy just one night only on our TV screens before vanishing off onto audio adventures for an eternity. The San Francisco of 1999 was the backdrop for his battle against Eric Roberts’ Master, an intermittently threatening presence with a great line in evening wear. The downer for long-term fans with this set is the fact that they’ve all been released before, though that was near the start of the range, the technology and ambition available to the Restoration Team who put the DVDs together clearly improving over the years. Now, in addition to all the previous extras, we get a bundle more, a substantial haul which it’s hard to fault. Talons is awarded three discs this time around, with a typically bonkers Tom Baker meeting ex-producer Philip Hinchcliffe in his kitchen to discuss their time on the story and a number of mini-documentaries examining every aspect of this much-loved tale. Caves gets an informative new documentary from TV and film historian, and über-fan, Matthew Sweet plus an odd appearance on Russell Harty from Davison and the incoming Colin Baker, while the picture quality on the story itself is impressively clear.